Do you want to attract more attention to your business? Are you wondering how you can build relationships with the influencers in your market? To learn why it’s important to reach out to bloggers, I interview Scott Monty for this episode of the Social Media Marketing podcast. 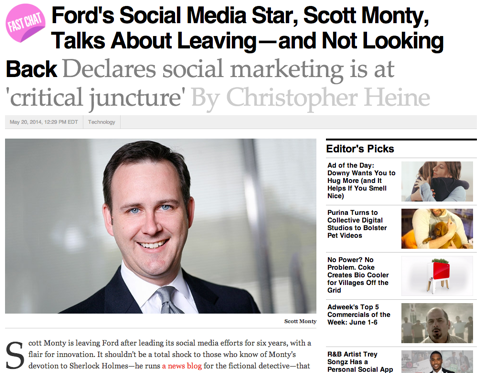 In this episode, I interview Scott Monty, the former head of social media for Ford Motor Company. He blogs at ScottMonty.com and his podcast is I Hear of Sherlock Everywhere. 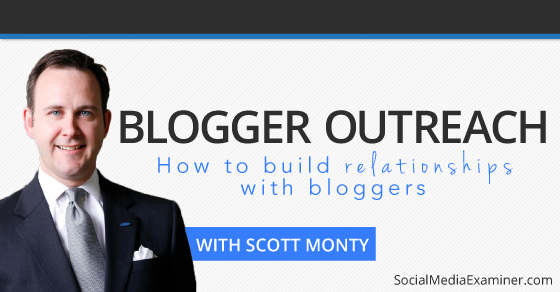 Scott shares how to build relationships with bloggers to raise your visibility. You’ll discover the types of influencers you need to reach out to and how to engage them in a positive and productive way. Scott’s latest interview with AdWeek. Scott explains the reason for that comment was to address the concern marketers have in the drop in organic reach with their posts on Facebook. The challenge now is you can’t ignore Facebook because there are over 1.2 billion people who use it, and you have to find a way to live with it. Scott says the reason why he calls these sites rented is because they are ultimately in control. If you look at Facebook, they can change the algorithm any time they like, and marketers have to suffer the consequences, unless they are willing to pay. You need to look at your owned sites, where you do have control. Scott thinks it’s best to centralize your content in a hub, then have digital outposts of rented spaces and good relationships with influencers. Then use paid media around all of that to strategically amplify your earned, owned and rented spots. Listen to the show to find out why it’s not just about using paid for promoting your ads. Scott says that blogger outreach isn’t that different from media relations. You need to look at who the influencers with an audience are, and figure out if you can either invite them to special events, give them an experience with your products or let them meet with the executives of your company. Then they can go and tell a story to their audience. Some bloggers have huge networks. Image source: iStockPhoto.com. Any brand has a story to tell and you have to think of ways you can inspire others to tell your story. Once you have figured out who the main industry influencers and bloggers are in your industry, then you can start to reach out to them. It’s important to take note of how they interact with other brands too. You’ll discover the parallels and distinctions between public relations and blogger relations, and how to treat each type of influencer differently. When Scott was at Ford, they mixed the bloggers in with journalists. Some of the true journalists weren’t happy about that, and didn’t give bloggers full credit for what they were able to do. Listen to the show to find out how Scott and his team handled the bloggers and journalists together. Scott explains that most bloggers don’t have the same reach or potential reach as a traditional journalist. Although there are many bloggers who have been brought under a network approach. For example, if you look at the Gawker family of sites, they each started out as a hobby. Jalopnik for automotive, Gizmodo for tech, Jezebel for women’s issues and Deadspin for sports fans. All of these sites were brought under Gawker’s network. 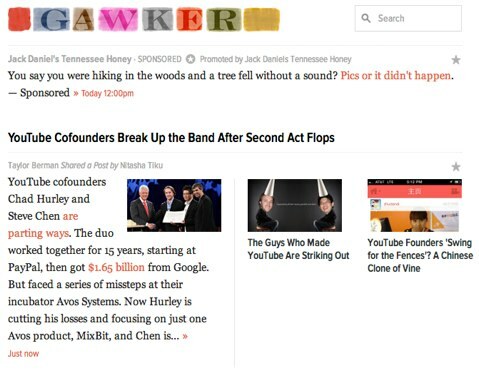 Gawker brought a lot of blogs that started as hobbies under their network. They now all have the infrastructure, support, media buying team and a team of journalists to go out and do their job. Scott advises you to spend a lot of time on bloggers’ publications to see what they write about and how often they post. You also need to find out whom they interact with. You’ll hear how you can reach out to bloggers and start to build a relationship with them. There are millions of bloggers out there in every niche. You can go broad and wide or narrow and deep, depending on what you want to accomplish. Listen to the show to discover what you can do to enable bloggers to understand the specifics of your products and build a niche relationship with them. Scott says that the first thing is to know your industry. Start to look at trade publications to get a sense of what’s being covered. The next thing you need to do is try to map to the different influencers in your space. You can find people who are quoted in the news or the various publications. 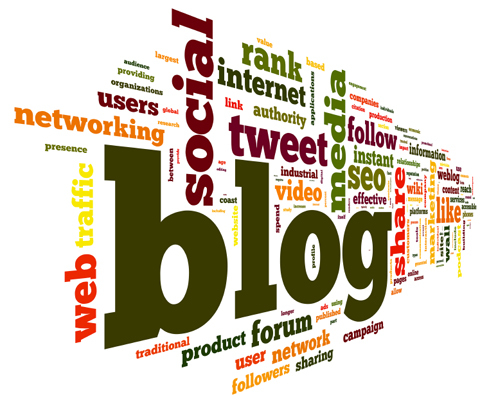 One idea is to look at Technorati to find bloggers, see what their sites are like and the influence they have. Other sources you can look at include Alexa, Compete and Quantcast. 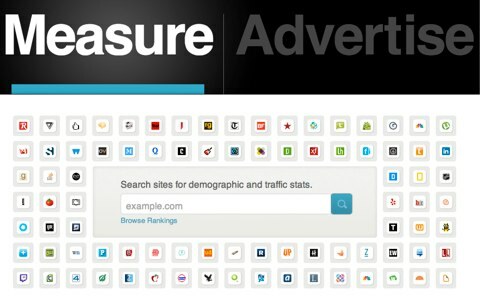 Use Quantcast to find out how big a blogger’s audience is. Before you contact them, make sure you have your assets ready to deploy and that it’s done in conjunction with your communication team. In terms of assets, visuals work really well right now as a way to communicate and physically demonstrate what you have to offer. Listen to the show to hear what type of visuals work well with bloggers and journalists. The first thing you need to do is to spend time on their website, look at their activity on Twitter and head over to their public Facebook profile. This way you can see what they talk about and the kinds of things they share. You can gain many insights from someone’s personal Facebook profile. You can also see how they interact with others. This will give you a sense of the caliber of the individuals and their relative respect within the community. You’ll now have an idea how to interact with them yourself. Once you are ready to make contact, visit their Contact page to see their preferred method of communication. Always use what is native to them, not you. Check their Contact page to find out their favorite method of communication. Listen to the show to find out what you can include in that first point of contact that will get their attention. Scott explains that the best way to stand out to a blogger is to understand who they are, what they are personally interested in and make sure your proposal is something that appeals to them. A great example of this is when Scott worked at Ford, they did something unique for the Focus Global Test Drive. The Focus model was being relaunched globally and they wanted to invite 20 influencers to join them in Barcelona to take part. 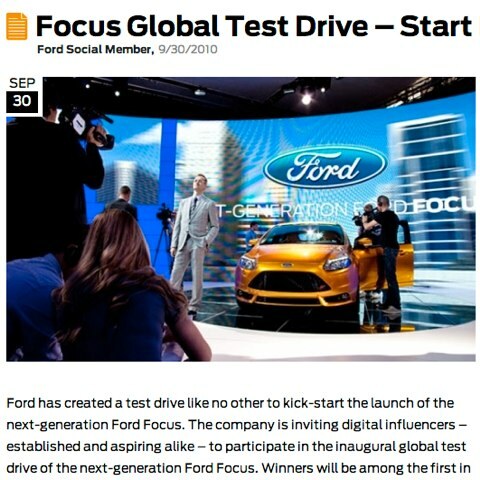 Ford invited 20 influencers to join them in Barcelona for the Focus Global Test Drive. So they created 20 customized videos for each influencer, with a personal invitation included. The video below was created for a blogger, who Ford knew loved football. You’ll hear the reaction that they received and the benefits of it being a YouTube video. In fact, 75% or more of these influencers thought it was so cool that they wanted to share it with their audience. When done right, videos are a great way for you to catch a blogger’s attention. Listen to the show to hear a way that I used video to give people an opportunity to be in front of my audience. Scott describes how when he first started at Ford, they had a traditional model-year event at the test track, featuring every one of their vehicles for the following year. They invited auto and business journalists to take a test-drive in each car. Then about a month after he joined, he suggested that they invite 10 bloggers to their Ford Auto Shows. The following year it went up to 15, the year after 50 and at the last one it was 100 bloggers. It’s a way for Ford to gradually grow their program. They know what they want to achieve from this. 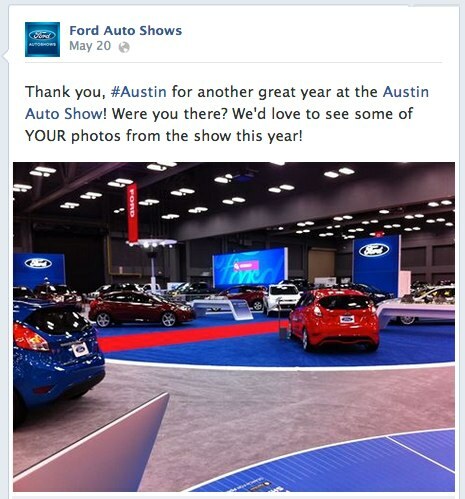 Ford uses auto shows as an opportunity to invite influencers to join them. Ford’s goal is to get more awareness, build relationships and have the highest share of positive voice among all of their competitors at these types of events. Their relationships with bloggers have grown from that point. Scott says that you need to plant a flag somewhere and start from there. Maybe start with a particular niche. Even if it’s one blogger or a handful. It’s a way to see if what you are trying to achieve is actually possible. You’ll discover why trade shows are the perfect place to build relationships and what you can do to get the ball rolling. Listen to the show to find out why person-to-person relationships are so important for your business. Scott says that it will vary for everyone. He thinks that whatever you do, you have to be completely transparent about it. The Federal Trade Commission (FTC) requires bloggers to disclose relationships they have with brands. Yet they don’t require that of journalists. You’ll hear what Scott’s views are on this subject. 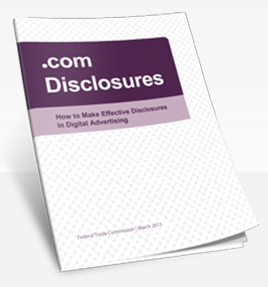 Check out the .com Disclosures guide for full details. As a marketer, you need to decide what you’ll pay for. At Ford, they knew that they would never pay for journalistic coverage; however, there are ways to get bloggers involved and reward them for their efforts. If you want to pay for media coverage or pay for a post, Scott says that you have to understand that you are moving outside the realm of journalism. You’ll discover why you are now moving into the space of marketing. It’s just a different form of advertising. It happens to be on their site and in their words, but at the same time it promotes their brand. It’s important that everyone discloses what the relationship is. Scott talks about a document that Ford shares with their bloggers before they visit them. It’s available online for anyone to follow. This is a way for Ford to be completely transparent about what they do and what their expectations are from the blogger. Ford’s Rules of Engagement with Online Influencers. You’ll discover the different ways you can compensate a local blogger or an out-of-town blogger. Listen to the show to hear what expenses were involved with Ford when they invited 200 influencers to their Trend Conference. Scott says that you need to understand what motivates each blogger. Some bloggers might love a chance to have a one-on-one with the main person involved in the launch. However, others might be more interested in a behind-the-scenes tour. For example, you can give them a full tour of your factory floor, and offer for them to take snapshots along the way. You need to treat them really well and give them the full experience. Check out the full podcast episode with Scott Monty. Listen to the show to discover which key people from your business you can offer for bloggers to meet as an incentive. I’ve recently discovered a brand-new tool called Snip.ly, which allows you to share content to other people’s websites, and at the same time bring them back to your own content with little effort. It works similar to Bit.ly, as it’s a link shortener plus more. It allows you to put a link to any destination, whether it’s your own content or someone else’s content. The next step is where the magic happens. For example, if you were to link to one of our articles at Social Media Examiner, you would paste in the URL of that article into Snip.ly, and you would be given the option to create a piece of text and an additional URL. This information then floats at the bottom of your screen and includes your photo. Notice the information floating at the left-hand side. 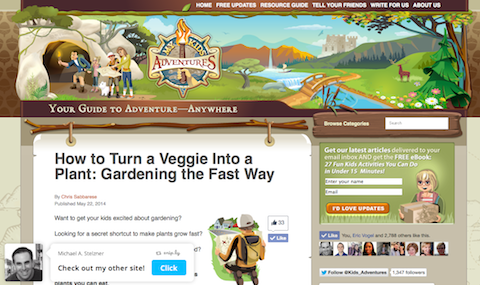 I put in a link to My Kids’ Adventures. After I put in the link to our parenting website, I put in the words “Check out my other site,” then I put the word “Click.” When someone clicks on that, it takes them to Social Media Examiner. You’ll hear about the different plans available and the cost involved. You can be really creative with this, as there are many different ways to use it. I’m really impressed with this tool, and I recommend that you check it out. Connect with Scott Monty on his website, Twitter, Facebook and Google+. Check out Scott’s podcast: I Hear of Sherlock Everywhere. Read Scott’s interview with AdWeek. Take a look at Gawker‘s family of sites: Jalopnik for automotive, Gizmodo for tech, Jezebel for women’s issues and Deadspin for sports fans. Find out more about influencers on Technorati, Alexa, Compete and Quantcast. Read about the Focus Global Test Drive. Watch the 20 customized videos that Ford created for each influencer. See what Ford Auto Shows have to offer bloggers. Discover more about the FTC disclosure rules. 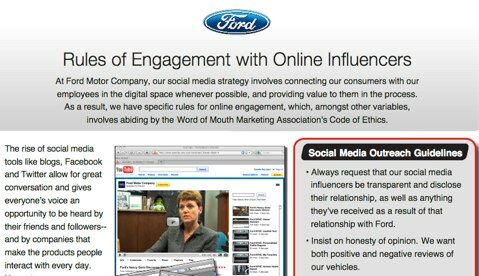 Check out Ford’s Rules of Engagement with Online Influencers document that they share with bloggers. Try Snip.ly as a way to share content to other people’s websites. 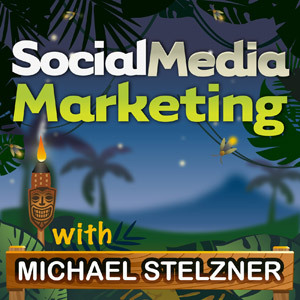 Contact Emily at emily@socialmediaexaminer.com if you’re interested in sponsoring the Social Media Marketing podcast. What do you think? What are your thoughts on blogger outreach? Please leave your comments below.